Taking a shower is something that many of us take for granted. However, one thing is for sure - we use a lot of water in the process. Unfortunately, water is a limited resource like anything else, which is why it’s crucial that we do our part to conserve it. Whether you’re trying to save a little money on your utility bill or you’re concerned about your impact on the environment, having the best low-flow shower head can make all the difference. Today we’re going to be looking at some of the top models on the market, as well as figure out the best elements to pay attention to when making a final decision. Getting the best low-flow showerhead isn’t something you can do on a whim, so it’s crucial that you understand all of the various components that can impact the performance and reliability of your system. So, with that in mind, let’s take a look at what these models have to offer. When it comes to low-flow showerheads, one of the most prevalent issues is that they can feel a bit underwhelming when in use. You’re trying to save water, but that leads to a lackluster shower that doesn’t give you the pressure you want. Fortunately, this model from High Sierra helps alleviate that problem by delivering larger drops in a steady stream. Thus, instead of a bunch of tiny, high-powered jets, you get more of a cascading effect. Overall, it may take a little while to get used to, but the way this shower delivers water is superb, and it will be strong enough to ensure that you can clean every part of your body, including long, thick hair. Another element that we really appreciate about High Sierra showerheads, in general, is their construction. All too often, most models are made of plastic, which can feel a bit flimsy, and it’s prone to leaks. These showerheads will have a metal casing to add some durability, but they are definitely not as strong as this unit. Yes, you will be paying a little more up front, but you can have peace of mind knowing that it will stay in pristine condition for years to come. Because part of the reason you want a low-flow showerhead is to save money, you’ll be happy to know that you can save up to 40% on your utility bill by using this model. Most high-pressure systems will drain about 2.5 gallons per minute on average, but this one only uses 1.5 gallons, making it a much better choice for both the environment and your wallet. Finally, High Sierra showerheads are also compact enough to fit almost anywhere. Thus, if you need a new head for your RV or boat shower, or you have a smaller bathroom with limited headroom, you’ll appreciate the fact that you don’t need much space for this unit. Also, it’s super easy to install, so you can upgrade in minutes. For the most part, High Sierra is one of the top names in the industry for making high-quality low-flow showerheads. We’ve already seen the company’s commitment to quality and excellence with the standard model above, but what if you want a handheld showerhead instead? Many people appreciate having the capability of washing each part of their body individually, meaning that a handheld model is the best option out there. This unit comes with a 72” long stainless steel hose, enabling you to maneuver around with ease. Also, because the head itself is relatively small, you can install this model in almost any shower and have room to spare. To make the handheld portion even better for you, it has a textured grip. With some models out there, the handle can be a bit slippery, particularly if it’s made of plastic. In this case, though, it’s a solid textured rubber material that ensures you can maneuver around your body without losing control. As with other High Sierra Showerheads, this unit uses about 1.5 gallons per minute. However, if you really want to maximize your water savings, you can choose to have the trickle valve installed as well. This valve allows you to shut off the water almost entirely, which can help save some extra cash (and the environment). As the name suggests, some water will continue to trickle through (to alleviate pressure), but it will make a huge difference on your utility bill. One feature that we didn’t mention above with the High Sierra Showerhead is that it’s clog free. Thus, you don’t have to worry about hard water creating calcium or limescale buildup over time. Even though the whole thing is 100% metal, it’s coated to prevent clogs and ensure that you have a magnificent shower experience every time. In some cases, having a low-flow showerhead is a necessity because your system is designed to limit the water pressure coming out. However, because most people like having an abundance of pressure in their shower, you will want to upgrade to something that can make the most of your low-flow plumbing. This model from Aqua Elegante is here to help. While it is initially designed to work in tandem with a low-flow system, it can be upgraded to increase the pressure that comes out. As with all showerheads, there is a flow restrict or in the base. However, it’s super easy to remove (the company has instructions on their website) so that you can increase the pressure without having to adjust your plumbing at all. Overall, doing this means that you won’t necessarily save water, but it will create a better cleansing experience for you, which can make all the difference. To create a spa-like shower, this head comes with 36 individual nozzles, creating a rainfall spray that is both relaxing and refreshing. Best of all, the nozzles are self-cleaning, meaning that they automatically resist corrosion and calcium buildup. To help you get the most from this showerhead, it comes with a variety of finishes. While it’s not as durable as something like the High Sierra models, it has rugged ABS plastic components and metal parts to ensure that it will last for a long time. Also, installation is a breeze (even with removing the restrictor), so don’t worry about having to call a plumber to get this unit up and running. So far, each of the showerheads we’ve seen has been a single-purpose model. This means that they only offer one type of spray, which can either be to your liking or not. However, if you prefer to have some versatility when it comes to taking a shower, then you will appreciate the performance and flexibility of this head. The primary selling point of this showerhead is the fact that it comes with six different spray patterns. You can choose from rainfall to massages, as well as a water saving “low-flow” setting that helps lower your utility bills. Best of all, this head can be adapted for both low or high-flow systems, making it even more versatile. As with the other Aqua Elegante model, this unit is made of rugged ABS plastic with a metal finish. You can choose from a few different looks to ensure that you get the one that’s right for your shower. Also, with such fast and easy installation, you can upgrade your bathroom experience in less time than it takes to wash yourself from top to bottom. When looking at the name of this showerhead, you’ll notice that it says “luxury.” The reason for this is two-fold. First, it has a large, four-inch surface that ensures the spray covers your whole body. Unlike the High Sierra showerheads that have a narrow stream, this one will cascade over you like a waterfall. Secondly, the massage settings, coupled with the high-pressure system, enables you to get the relaxation you deserve. Make yourself feel more comfortable by pulsating your body with high-powered jets, and then slow things down with a rainfall setting afterward. Although we love the High Sierra Showerheads we’ve seen thus far, some people may prefer something that has a little more pressure. Overall, the stream offered by these heads is sufficient for most users, but if you’re used to a high-pressure system, then you may be a little disappointed by the results. So, if you’re trying to conserve water while still getting the experience you crave, then you might prefer this model instead. It comes with all of the same excellent features as the other High Sierra Showerheads, but the primary difference is that it uses 1.8 gallons per minute instead of 1.5. That may not sound like much, but when you compare them side-by-side, you’ll notice that this one has a much more robust stream. As you can imagine, the construction of this showerhead is incredible. Rather than using plastic components that can wear down or crack under pressure, this model is made of 100% metal parts. This means that you can use it for years to come without worrying about leaks or damage to the inside. Compared to high-pressure showerheads, this unit can save up to 28% more water overall. Thus, when you start paying attention to your utility bill, you’ll appreciate what this model has to offer. Also, considering how quickly you can install it in your bathroom, it’s never been easier to upgrade to a better shower. 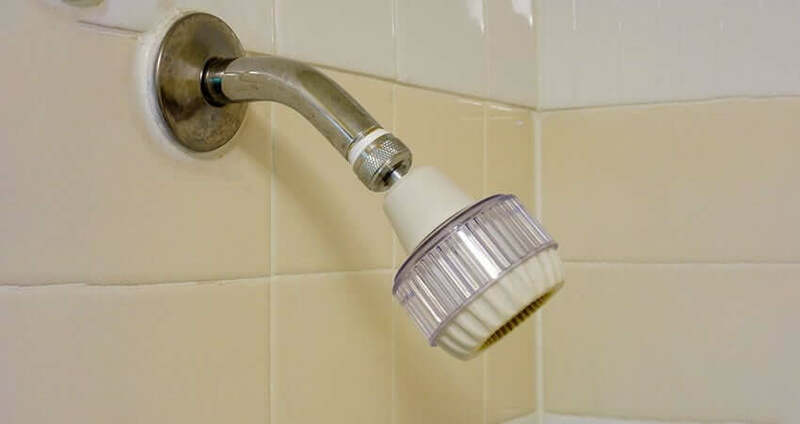 Depending on how many people live in your household, you need a showerhead that can withstand daily use and abuse. Because everyone will be moving and adjusting the position of the head, it’s imperative that you find one that’s built tough. Usually, showerheads are made of plastic internal components and a metallic finish. While this can lower the overall price of the unit, the quality of the plastic can make a significant difference in the reliability of the product. Over time, these materials can wear down and develop cracks, which can create leaks and force you to get a replacement. The other thing to pay attention to when picking out the right material is the type of finish it has. Some units will only offer one coating, while other companies may provide you with some options. Typically speaking, showerheads will come in either chrome, brass, nickel, or a copper finish. Also, some of them may have a brushed look to them, creating a more timeless appearance in your shower. Finally, you also want to pay attention to the material of the nozzles themselves. In many cases, these parts are made of soft, rubber-like substances so that they don’t develop calcium buildup. If your showerhead is all metal, then buildup can be a real problem as it can impact the stream. Over time, it will begin to dribble out less effectively, meaning that you have to clean it more often. When it comes to showerheads, most of them install quickly and easily onto your current pipe. All you have to do is unscrew your current head and pop a new one on. In most cases, you can swap them out in minutes, all without professional supervision. However, if you want a more complex showerhead, then you will likely have to consult a plumber to get it installed. If there are other components that fit into the wall, or if you have to add a new water selection handle to the system, you probably can’t do all of that yourself. Another thing to consider is that most showerheads come with a flow restrictor. Although we’re talking about the best low-flow units, sometimes you may prefer to upgrade your water pressure for a more intense experience. However, some manufacturers may make it difficult or impossible to remove this component, while others make it easier. If you don’t care about taking it out, then you don’t have to worry about it. Otherwise, you should see if the brand mentions anything about it so that you can make sure you’re choosing the right one for your needs. Considering that we’re looking at the top low-flow rated showerheads, it’s imperative that you understand what constitutes “low flow” in the first place. Usually, showerheads are designed to use about 2.5 gallons of water per minute. High-pressure systems may go a little above that, but that’s typically the cap because more pressure can be somewhat dangerous. For example, if you used a head that delivered 3.5 gallons per minute, it could damage your skin or create a drowning situation because so much water is hitting your body at once. To be considered “low flow,” most showerheads have to be below the two GPM mark. For ideal results, it should be at 1.5 GPM. This will help you save more water without dropping the pressure too much in the process. One thing to consider, however, is if your plumbing is set up with water restrictors in the pipe. As we mentioned, some showerheads allow you to remove their flow restrictors to increase the pressure, but if your pipelines are not built to let more water to come through, then it will be a moot point. Typically, though, removing your flow restrictor will usually increase the overall pressure. In most cases, showerheads are designed to deliver one spray pattern. However, if that’s not sufficient for your needs, then you will want a model that can be adjusted easily. Usually, these units will come with a knob selector that allows you to switch between different sprays, allowing you to get the shower experience you crave. In most situations, you should be able to get several massage settings, as well as a few rainfall patterns to create a more luxurious shower. Also, some heads may enable you to reduce the overall flow rate so that you can adjust how much water you’re using at any given time. Another setting you may prefer is a shut-off valve. If you’re trying to maximize your water conservation, then this valve can help you lower your utility bills and your impact on the environment. One thing to remember about these valves, however, is that they will usually allow a little bit of water to flow out to ensure that pressure doesn’t build up too much and cause damage to the head or your plumbing. For many people, a fixed showerhead is more than sufficient for their cleaning needs. However, for others, they prefer having the flexibility of a handheld unit that can move around their body. These models will have a head connected to a long hose so that you can reach any part of yourself to clean it more thoroughly. In some instances, you may be able to find a dual unit that has both a fixed and a handheld showerhead. These models are great because they offer much more versatility and flexibility overall. Some points to consider when comparing fixed vs. handheld showerheads. Water Pressure: in some cases, the addition of a hose can limit the pressure coming out. Thus, in low flow systems, you may notice a substantial drop. Stability: if you have a handheld showerhead, the holster may not keep the head locked into place. This means that it will wobble or turn to one side, meaning that you can’t use it as a fixed head when necessary. Leaks: because there are more connections in a handheld system, there are more chances for a leak to develop. When it comes to finding the best low-flow showerhead, we believe that durability and reliability are crucial. Also, it’s imperative that you save water in the process since that’s part of the whole appeal of having these models in the first place. Thus, with that in mind, we highly recommend either the High Sierra Fixed Showerhead or the Handheld model. Both of them are well-built with 100% metal construction, and they are designed to improve the overall flow of your shower, even while using less water in the end. We believe that each of these units is going to last much longer than the competition, and they will ensure that you save both money and the environment in the process. Best Water Softener System – Tested & Reviewed!